Aurora University in Illinois has established a new program in leisure and environmental resources administration. As a part of the College of Arts and Sciences, the program will be coordinated by five faculty members formerly associated with a similar program at George Williams College, Downers Grove, IL, which closed its doors last December. Under their leadership, the George Williams' program in leisure and environmental resources administration earned national recognition. It also became one of a select number of college programs accredited by the National Recreation and Park Association (NRPA). The Bloomington Parks and Recreation Department announces the appointment of NANCY NIEBUR as superintendent of recreation. Ms. Niebur is a graduate of Indiana University with a B.S. degree in recreation and park administration. She is presently completing her master's thesis at Illinois State University. She previously studied at the University of Edinburgh, Scotland, and has graduated from Indiana University's executive development program and the National Recreation and Park Association's (NRPA) Arts Management School. Ms. Niebur is a member of the Illinois Park and Recreation Association (IPRA). She has worked at the Downers Grove, Urbana and St. Charles Park Districts. DONNELL LANGSTON, assistant professor of leisure and environmental resources, and JAY YOUNG, associate professor in park and recreation administration. Also joining the faculty will be two nationally known experts in the fields of recreation and environmental resources. STEVE VAN MATRE, author of The Earth Speaks and Sunship Earth, will serve as associate professor of environmental education and interpretation. NELSON WIETERS, former president of the American Camping Association (ACA) and authority on outdoor recreation and education, will also join the faculty. Additional program information is available from the Admissions Office, Aurora University, Aurora, IL 60506. Phone (312) 896-1975. MIKE POPE, Elmhurst Park District's director of parks and recreation, has recently elected president-elect of the National Recreation and Park Association (NRPA), the highest office available to a park and recreation practitioner. He automatically assumes the presidency for a one-year term in October, 1986. Pope earned his bachelor's and master's degrees in leisure studies from the University of Illinois. In April 1985, he received the Charles K. Brighbill Alumni Award from the university for his outstanding contributions to the leisure field in leadership, scholarship, personality and character. He is currently president of the university's College of Applied Life Studies Alumni Board. As an NRPA member for 25 years, Pope served on several committees as well as chairing the National Forum, the major advisory body to the board of trustees. BETTY LOU JENKINS of the Champaign Park District recently received an Individual Merit Award from the Illinois Association of Park Districts (IAPD) for her 47 years of service to the parks and recreation field. IAPD Executive Dir. Ted Flickinger presented the award to Jenkins during the district's party honoring her retirement. The certificate, he said, was presented "not for what Jenkins last did, but for what she did that will last forever." Ms. Jenkins' career started in 1938 as part-time supervisor of athletics for women and girls at the Danville Recreation Department. It also included service at the East Alton and Roxana Playground Commissions, the City of Belleville, and the Champaign Playground and Recreation Commission. She joined the Champaign Park District staff in 1967 when the district assumed programming for the city. Her responsibilities included the di rectorship of Prairie Farm. She also organized the district's first day camp and developed an adult volleyball program. Pictured (from left to right) are Flickinger; Jenkins; Robert Toalson, general manager of the Champaign Park District, and Cynthia Capek, director of recreation. TOM KRUSE has been named executive director of the Clyde Park District in Cicero, IL. He was director of the Belvidere Park District for four years. His other positions have been with the Mt. Prospect, Arlington Heights, Hanover Park and Chicago Park Districts. Kruse is a certified professional with both the National Recreation and Park Association (NRPA) and the Illinois Park and Recreation Association (IPRA). He currently serves on the IPRA board as director of the Administration and Finance Section, and also served as Northern Region representative in 1983-84. Kruse is past president of the Northwestern Illinois Association for Parks and Recreation (NWIAPR), and chairman of various committees, councils and task forces. He has a bachelor's degree in education from Illinois State University and graduate credit in recreation administration from George Williams College. KATHY VAVREK assumed the position of senior/adult coordinator for the Franklin Park Park District last November. She had previously worked for the Berwyn (IL) Playground and Recreation Commission. Ms. Vavrek has a bachelor's degree in recreation management from Carthage College in Kenosha, WI. She is a current member of the Illinois Park and Recreation Association (IPRA) and local recreation organizations. Each year individuals are singled out and recognized for their significant professional contribution as well as for service to their community. A joint brochure published by the IAPD, IPRA and NRPA Great Lakes Regional Council (GLRC) is being mailed to all members in May. The brochure will provide award criteria details and nomination forms. NRPA-GLRC award nomination forms are due July 1. IAPD and IPRA nominations are due August 1. All members are encouraged to participate in this prestigious event. The honors bestowed to award winners help to maintain the winning spirit for the profession as a whole. Those with questions or comments are encouraged to phone their respective Association. ARTHUR A. GILL has been appointed to the Grayslake Community Park District Board of Commissioners. His appointment became effective on Nov. 26, 1985. Gill, 36, is supervisor of rangers for the Lake County Forest Preserve District. He has a bachelor of arts degree in park and recreation administration from Western Illinois University in Macomb. His professional affiliations include the National Recreation and Park Association (NRPA), Illinois Park and Recreation Association (IPRA) and the Midwest Institute of Park Executives. Park and recreation officials can learn how to make more profit, raise funds faster and serve the public better at a special workshop being offered by the Gold Medal Products Co. The SPRING CONCESSION SEMINAR will be held on March 21 from 6:30 to 9:30 p.m. at the Quality Inn O'Hare in Schiller Park. There is no attendance fee for representatives of any organizations operating snack bars or concession stands. Additional information is available from the Gold Medal office in Chicago, (312) 678-8050. 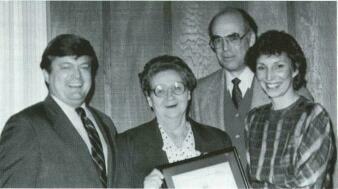 The 1986 Illinois Governor's Conference on Tourism will be held April 15th and 16th in Springfield. The theme of this year's event is "Harvesting Illinois' Newest Crop: Tourism." The Addison Park District recently acquired 11.7 acres of land with the assistance of a federal Land and Water Conservation (LAWCON) grant. 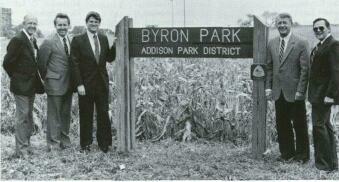 This acreage, named Byron Park, will be developed into a neighborhood park. Pictured from the left are Earl R. Casper, board secretary; Donald R. Jessen, board vice-president; Lee Daniels, minority leader of the Illinois House and state representative from the 46th District; Roman E. Strzala, board commissioner, and William G. Forest, board president. Herb Melleney, managing director of the International Festival Association, and Dante Laudadio, chair of the Hospitality Administration Department at Florida State University. Illinois Gov. Jim Thompson will speak to the tourism industry on the status of Illinois' tourism economy during the Governor's luncheon. Additional information is available from (217) 793-3733.